Since most have the Friday after Thanksgiving off, we need to change the meaning of TGIF. My idea here is to slow down the passing of Friday and the rest of the weekend. So for this week only let’s just say TGIF means Thursday’s Gift Is Friday. So we have the whole day, and the next two before reality comes knocking at our door. 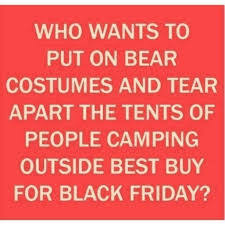 I hope you all had a good Thanksgiving and are not going to be mauled too much taking advantage of the Black Friday deals. Today’s JohnKu raises a question about Black Friday. Hope you have a good weekend. Freeze until the doors open. . . Through the eyes of children no worries indeed. Thank you, Suzanne. Or just not shop today. The best gift I’m getting, John is an extra day. Our fiscal year ends November 30, and I had one more vacation day to burn. Do I have Monday off, too. Still not planning to shop. Really wonder if Black Friday has surpassed Thanksgiving in terms of importance. As we move into a more material way of thinking, I would say so. You JohnKu expressed my thoughts exactly, John. I’ll be editing today and staying far away from the stores…those people are crazy! And on top of that, it is cold out there. The bad thing about shopping is that it costs money. Yes, the biggest downside for sure. Thanks, Greg. I’m definitely an “order-online” kind of girl. Tried the Black Friday thing once. Never again. 🙂 TGIF, John! Another good Johnku. I am going for the ordering online option. I am completely enjoying getting to the office about two hours early today, and we don’t open the doors for another hour. It’s quiet, peaceful; and I need it after yesterday. Totally understood. Used to show up at work before 7:00 in oder to get things done before my boss came in. Good to see you’re not in a Turkey Coma, Mr. John. Enjoy your day! What you propose works for me. Happy ‘OnLine’ shopping! Shopping online today! Good deals and some free shipping. May have to make a trip into CC next week for final shopping but will go early morning in the middle of the week. Enjoy this glorious TGIF weather which will get even better tomorrow. I am in no hurry for cold weather. Cheers! Thank you, Jo I agree about the on-line. Only was to go. I avoid CC like the plague. (Of course I think I’m becoming a recluse) Cheers back. I hardly ever go to stores anymore – I just order online. Food and the post office and the pharmacy being the exceptions. WHO in their right mind would want to shop on a day called Black Friday? Thanks, Vashti. I had a wonderful day. I’ve avoid Black Fridays for some time … so I just shake my head at those who embrace it with passion. Definitely ordering online for me!